Carry gear conveniently and comfortably with the 5.11 Tactical TacTec Chest Rig. Designed to be a lightweight duty rig, the chest carrier features an internal pocket system capable of carrying up to six full size magazines with both bungee and hook-and-loop flap options. The durable, weather-treated fabric ensures gear stays dry and protected. 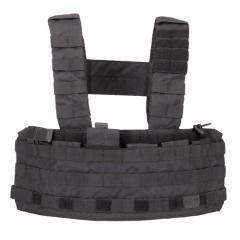 External MOLLE/PALS webbing grids allow for additional gear attachment across the chest and shoulders, as well as magazine stacking options. Built to handle the diverse needs of tactical professionals, the TacTec Chest Rig offers convertible pockets able to carry 500ml water bottles. Padded shoulder straps with an integrated mesh liner provide optimal comfort and maximum breathability for extended wear. With the ability to be worn as either an H-frame or Rhodesian strap set-up, this rig offers something for everyone.